I’m so happy that my Picnic String Quilt Block is the PMQG charity block of the month for October and I’ve shared the tutorial here! See below for more details on the finished Picnic Quilt from my book, Sewing for all Seasons. 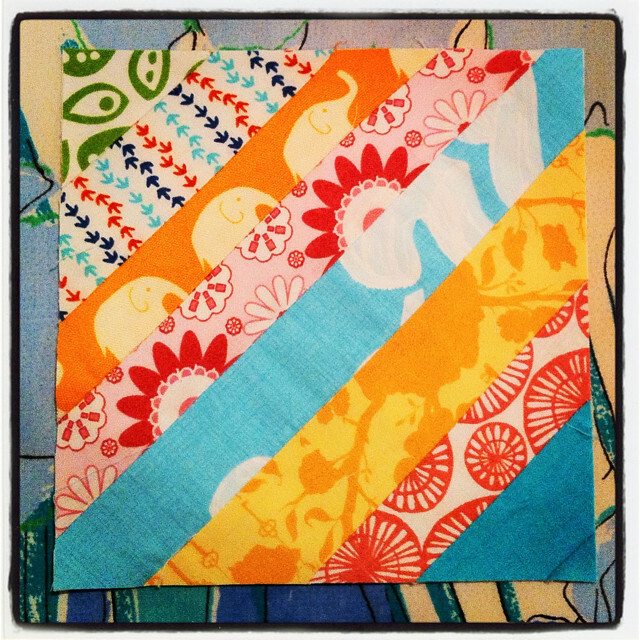 Here’s how to make this quick, simple and very scrap-friendly block, using foundation piecing on muslin. 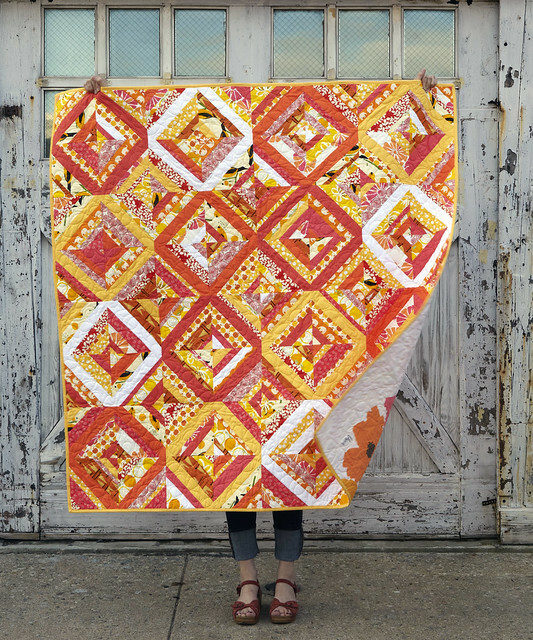 I miniaturized my original larger Picnic Quilt block to 6.5″ for this version, so it finishes at 12.5″ as a four-block diamond. I used all scraps in happy, summery colors for this version of my block, including some favorites from Monica‘s and Rashida‘s collections. To begin, cut muslin squares the size of your blocks (for this version, cut four squares that are each 6.5″ square). Choose a large selection of fabric scraps and strips in whatever colors you like best. 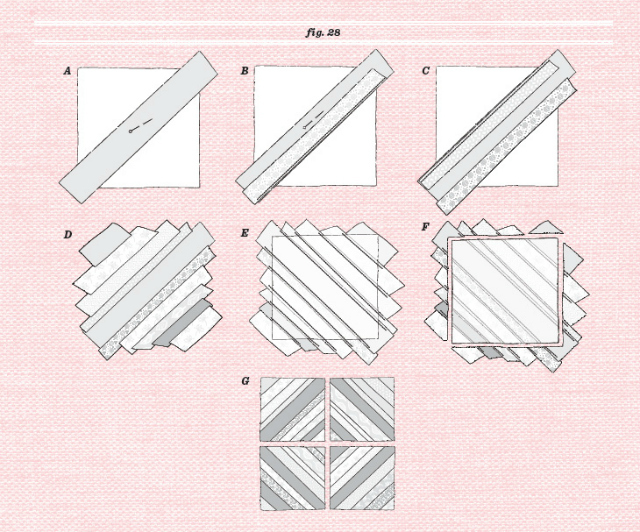 Begin by pinning a strip diagonally and right side up across your square of muslin, so that the ends extend past the corners (A) and then align a second strip overlapping it, right side down (B). Stitch with a 1/4″ seam allowance. Press. Continue adding more fabric strips on both sides of the original diagonal strip, pressing as you go (C) until you have filled your block with strips (D). Feel free to vary the strips’ widths, patterns, colors, and placement as you like – a random draw is a great approach to string quilting! Now press your block again and turn it over so you see the muslin back (E). Using a rotary cutter and quilt ruler, neatly trim your fabric ends away so your block is square and the sides are straight (F). 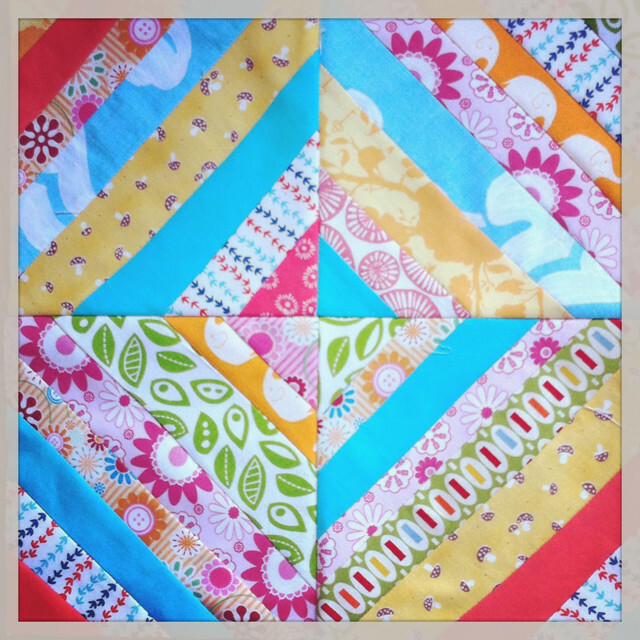 Create three more blocks the same way and postition the four blocks as a diamond (G), arranging them so that you have a nice mix of color, pattern, and strip widths. Join the first two blocks together with a 1/4″ seam allowance and press, repeat with the other two, and then join these pairs together for a four-block diamond! Here is my original Picnic Quilt from Sewing for all Seasons – you can find the full, detailed instructions for it in the Summer chapter of my book. My deepest thanks to Petra, Heather, Brittany and Rachel for their help in piecing the last two dozen blocks at a super fun impromptu quilting bee at my house, and to Nancy for quilting it! book party at Brooklyn Craft Company! sewing for all seasons release day + giveaways! Yes! Finally something about christmas christmas corporate gift baskets usa.